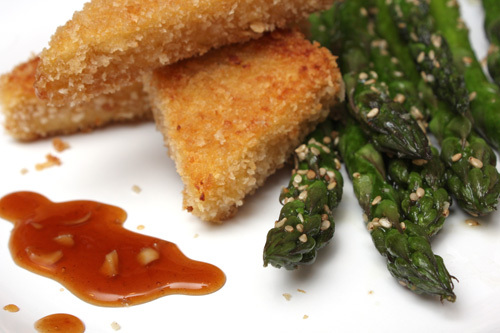 Here’s a recipe that caused a bit of a buzz when it ran in the June/July 2012 issue of Fine Cooking: the “Crispy Tofu with Sesame Asparagus and Hoisin Dipping Sauce.” I say this because I observed its recreation in the food blogosphere only days after the recipe was published. Folks were jazzed about tofu! And why not? This recipe does require a bit of methodical pacing, but it’s as forgiving as tofu can be. And asparagus quickly sauteed with toasted sesame oil can never fail. Dredging the salted tofu triangles in cornstarch, then eggs/hoisin sauce/rice vinegar/sesame oil, then panko breadcrumbs, is brilliant. This is what tofu needs to be dazzling. I fried my tofu triangles in two batches, using 1/4 cup grapeseed oil (rather than peanut oil) for each batch. It was so easy to fry these in a nonstick skillet. As for the “Asian chili garlic sauce,” I improvised on a tamer version, combining tomato paste and pickled garlic (to keep this kid-friendly). My sauce, therefore, was sweet/tart and enjoyable. You’ll enjoy the texture of your fried triangles. I also reached for the recipe for the “Sesame Almond Brown Rice Balls,” from 101 Cookbooks, because they seemed so clean and earnest. I made 13 fist-sized balls with this recipe, using brown sushi rice as instructed. I filled my balls with a crazy concoction of chopped olives, pickled garlic, and cornichons. My scallions were wild and purple. The cooked rice, here, is chewy enough to stick together. 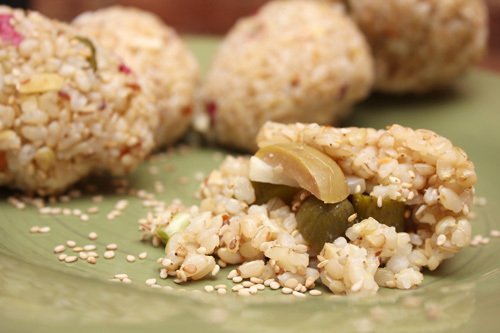 The sesame seeds and almonds make these balls nice to eat. My young child liked them, as I assume anyone might. Next time, I will cook the “Swedish Spuds,” from The Daily Spud (where I’ll include an amount of canned sardines), along with the “Barely Cooked Carrots with Tahini, Lemon, Garlic, and Sumac Dressing,” from Kalyn’s Kitchen. Come back to my site soon, to see what happens.